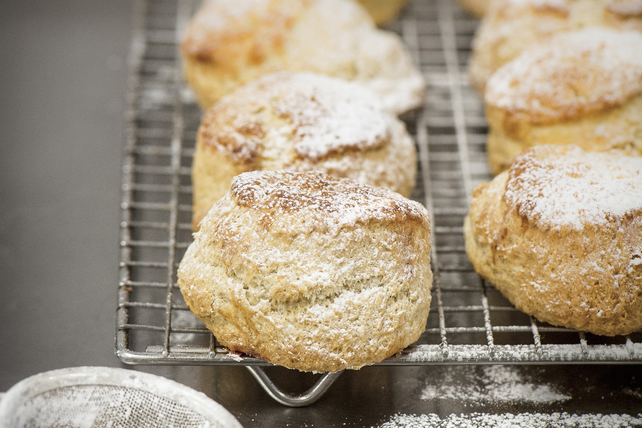 This recipe combines two classics - peanut butter flavour and flakey buttery scones. Top off these easy-to-make Peanut Butter Scones with a dust of icing sugar for a match made in heaven. Combine flour, granulated sugar, baking powder, baking soda and salt in large bowl. Cut in butter with pastry blender or 2 knives until mixture resembles coarse crumbs. Add buttermilk and peanut butter; stir with fork just until dry ingredients are evenly moistened. Knead with hands just until ingredients are well blended and mixture forms soft dough. Roll out dough on lightly floured surface to 1-inch thickness. Cut into 12 rounds with floured 2-3/4-inch biscuit cutter, rerolling scraps as necessary. Place on parchment-covered baking sheet. Bake 13 to 15 min. or until golden brown. Cool completely. Sprinkle with icing sugar just before serving. The cold butter helps to make the scones both tender and flakey. Also, it's important to knead the dough just until it holds together to prevent the baked scones from having a dense texture.